William Mansfield of Culmstock, Devon and his family. William Mansfield born in 1786 in Culmstock, Devon. William was baptised on the 29th December 1786 in Culmstock, Devon a small village about 17 miles North East of Exeter. On the 7th December 1812 he married Susanna Pearce Andrews in Crediton Devon. 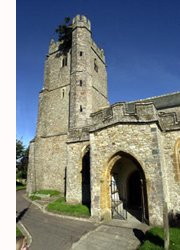 Crediton is about 8 miles North West of Exeter and about 19 miles from Culmstock. Opposite is a picture of the Parish church in Culmstock. Susanna was baptised on the 27th March 1791 in Topsham on the River Exe and 4 miles South East of Exeter. Her Mother was Mary Andrews but no Father was listed. They must have both moved to Crediton to live and start a family and it appears they produced nine children during the marriage. Samuel, William and Henry were baptised in the Parish Church but the remaining children were recorded in the Broad Street Chapel registry. Opposite is a picture of Culmstock Parish Church taken around 2003. This is a table of all the births and christenings of Willam ans Susanna's nine children. In the 1851 Census of Devon, Susanna (59) and a housekeeper is shown as living in the High Street, Crediton and the head of the household with her son James (19) a Curriers Apprentice and Selina (16) a shoe binder. In the same census a William Mansfield (34) is recorded as Head of household in Mill Lane, Northtawton, occupation Wool Comber. His wife is Elizabeth (44) and his son is William G. Mansfield (6). However a William Mansfield ...Father... (67)...Wool Comber ... Culmstock.. .Devon was also living at that address during the census. Was this Susannas husband away from home helping his son with wool combing. It should be noted that Williams other son Edward was also a Wool Comber and had also moved to North Tawton, which is near Oakhampton in Somerset.